It was quite a pleasant experience to wake up at 6.45am on Saturday morning after the 3.45am start the day before. 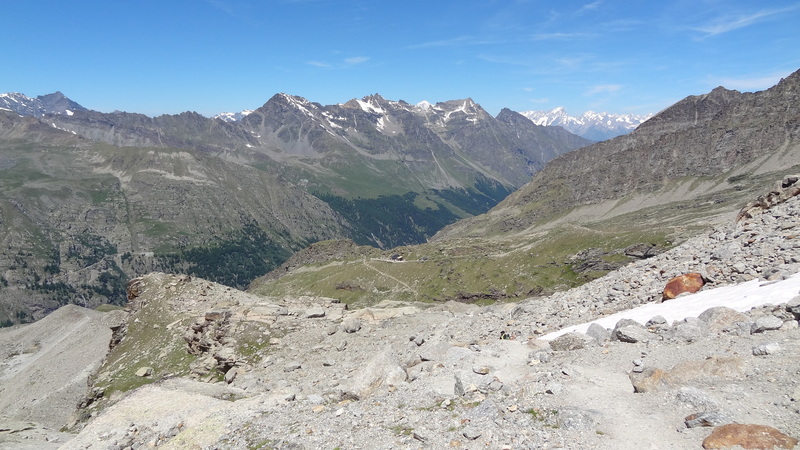 Today we would just be returning down the valley to our minibus parked at about 1,800m at the top of the mountain road from our second night in the Chabon hut. 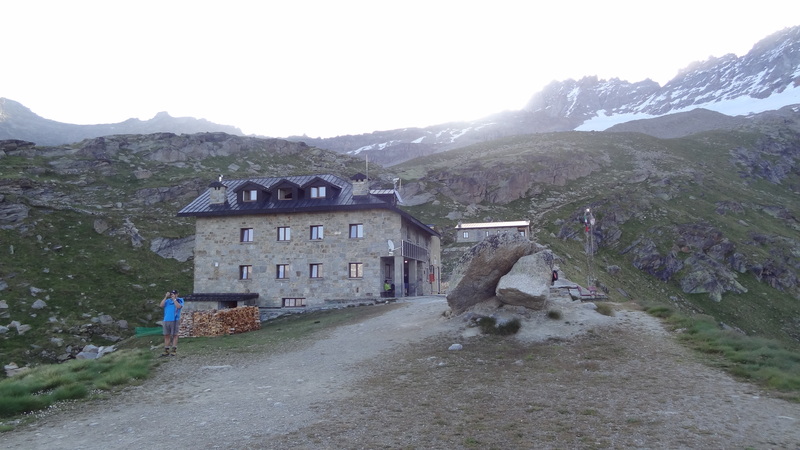 We had returned to the hut having submitted Gran Paradiso (4,061m) the day before. It was then almost surreal to have breakfast at 7am in a practically deserted hut. 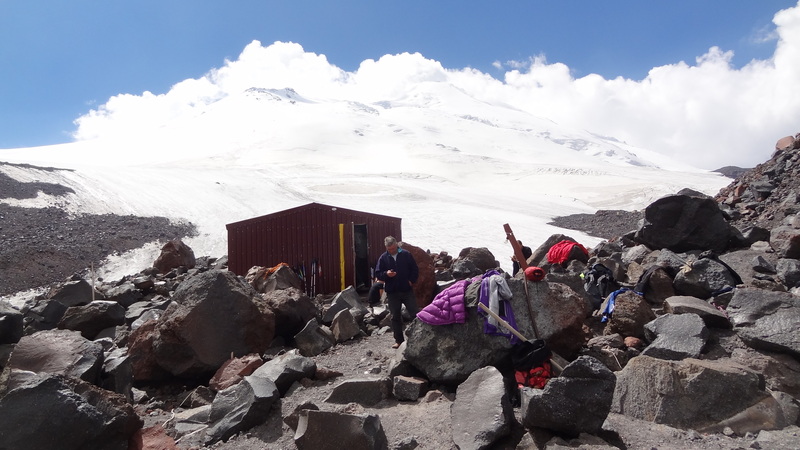 Everyone else who had stayed the night was well on their way up the glacier to the summit, and a glance out of the front door of the hut showed a snake of roped-up climbers up at about 3,500m, appearing ant-like in the distance against the whiteness of the snow. 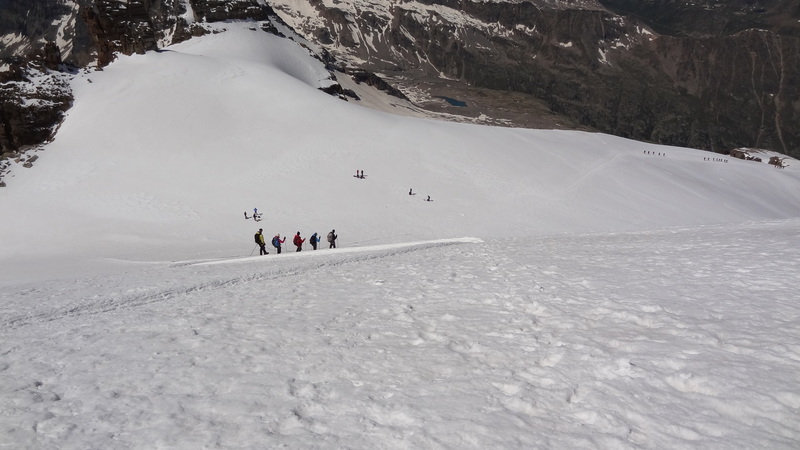 Looking one last time up the glacier – various teams of roped-up climbers can be seen in the far distance in the middle of the picture. Following a remarkably similar breakfast to the day before of dried bread and cereal, we were on our way out at about 7.45. 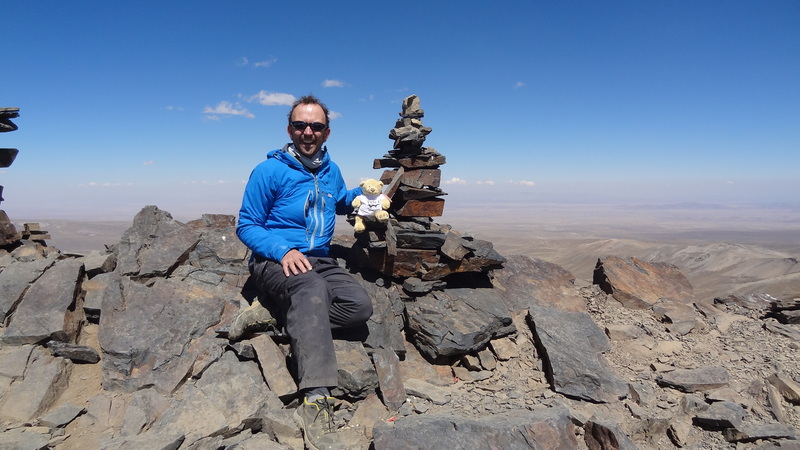 The rucksacks this time were bursting again with the things that we had either used yesterday (crampons, harnesses, ice-axes, helmets etc), or had carried up to the hut in the first place and left there on the climb, like toiletries, any spare clothes etc. The trek down from our base at 2,700m would take only about two hours, and would go via a different valley to the one we came up, so that Neil (our main guide) could take us on some bouldering practice. The bouldering would be useful practice for Mont Blanc, as we would have quite a technical section to overcome when we reached the Grand Couloir area there. 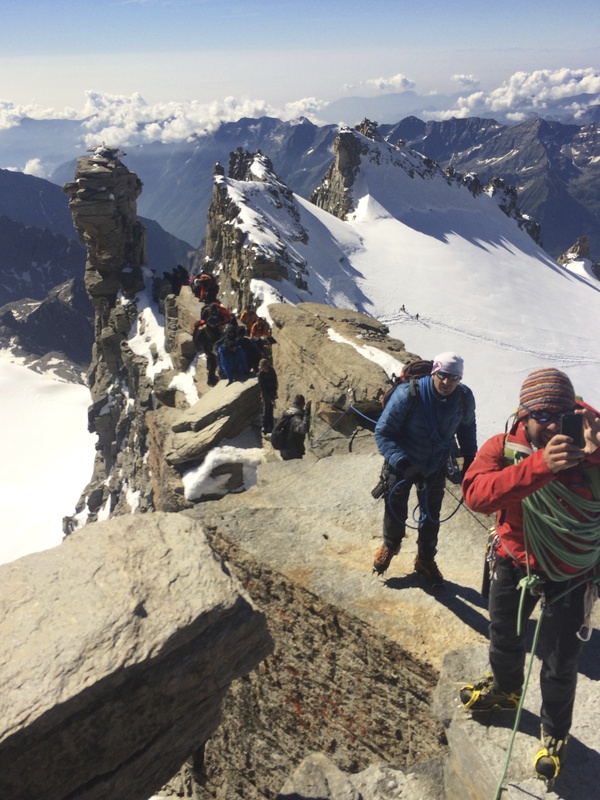 Our abilities to do this would be assessed to make sure that we were competent enough for the main climb, just as we had been assessed the day before for our “bottle” at the top of Gran Paradiso. 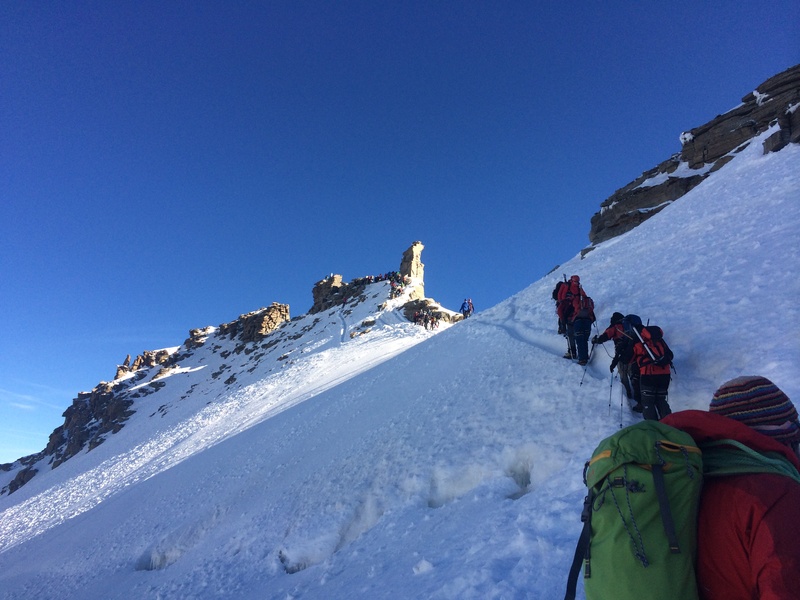 I hadn’t realised at the time, but that final summit ridge of Gran Paradiso (see yesterday’s blog post) was actually a test. If not technically difficult, it was still technical, and also a vertigo-inducing test of mettle, requiring clipping in via-ferrata style to a wall below which a very thin (probably 10cm wide) ledge separated you from about 1,000m of nothing but a free fall to what would have been instant death. The ledge was probably only 3 or 4m in length, but the expression “heart in mouth” doesn’t do it justice. When I first got to the ledge, having almost crawled along a narrow rock band on crampons to get there in the first place, I had suggested initally to our guide Marco that this was “far enough for me”. Upon saying this, (and not knowing that this was effectively being assessed), I then quickly realised that I was making a decision that would affect not only me, but all four of us (Marco the guide, plus Jonas and Katya), as we were roped up. The precariousness of our position, perched on the narrow rock ledge meant that unroping one member (i.e. me) would have been at best extremely unwise. Katya had then (very nobly) said “ok, we will all stay here as Chris won’t go”. I think this had made me realise that in my moment of fear, I was denying other people their summit, and so I decided there and then (for them) to go ahead and make the leap of faith. I was very glad afterwards that I had, for a whole host of reasons, but it just shows you that sometimes you have to think not just for yourself, but as to how your decisions can affect others too. It would be only later today, back in Chamonix, when I was talking to the owner of Mont Blanc Guides, that he told me that the summit ridge was in fact a test for Mont Blanc itself. 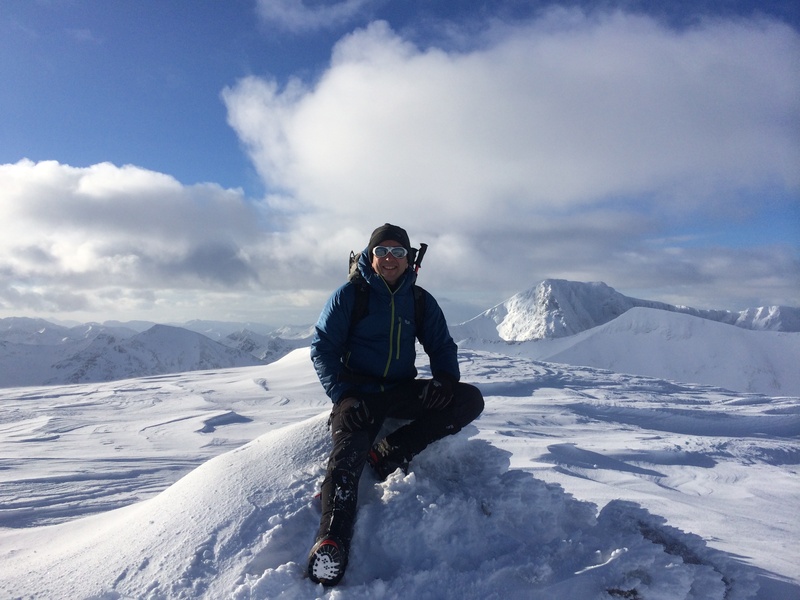 He said that it represented something ‘scarier’ than anything to be found on Mont Blanc, and so if clients could meet this challenge then they would be allowed to go ahead to face the (far greater in many other ways) tests of Western Europe’s highest mountain! So back to the bouldering in the here and now, we were led by Neil through a short loop of scrambling over large boulders, both ascent and descent. It was not terribly difficult, but did have at times some moments when a fall would have meant a bit of an injury, which of course gets the old heart pumping a little more quickly than it otherwise would. Leaving the Chabon hut for the last time, Sunday morning. And about to head down the beautiful valley, bouldering complete. And the beauty of the valley kept on giving…. Having got back to the minibus mid-morning, we returned back to France, a journey of about two hours via Courmayeur and the very impressive Mont Blanc tunnel. I cannot also not mention a stop half way in the Italian village of Mongex, where we stopped briefly for a gelato and coffee. I can only begin to describe here how good both were. My black cherry and Amaretto cone, plus espresso, were both probably the most delicious things I believe I have ever put into my mouth. ‘Nuff said, as they say! Back at base in Chamonix at lunchtime, Neil checked the weather forecast before dismissing us for a ‘free’ afternoon, where we could do as we please, shower (very badly needed after three days away I can tell you), and unwind before the forthcoming three day journey up to the main event beginning the next morning. He had actually checked the initial forecast the previous evening, and had warned us that the weather didn’t look good for Monday and Tuesday, and had said that if so, then we may not be able to summit. Everyone understood this of course, but no-one I think was really ready for the definitive news which we now got: Mont Blanc wouldn’t be happening. A weather front was coming in, the wind would be changing direction, and there would be snow (65cm was forecast that night in fact) and high winds. 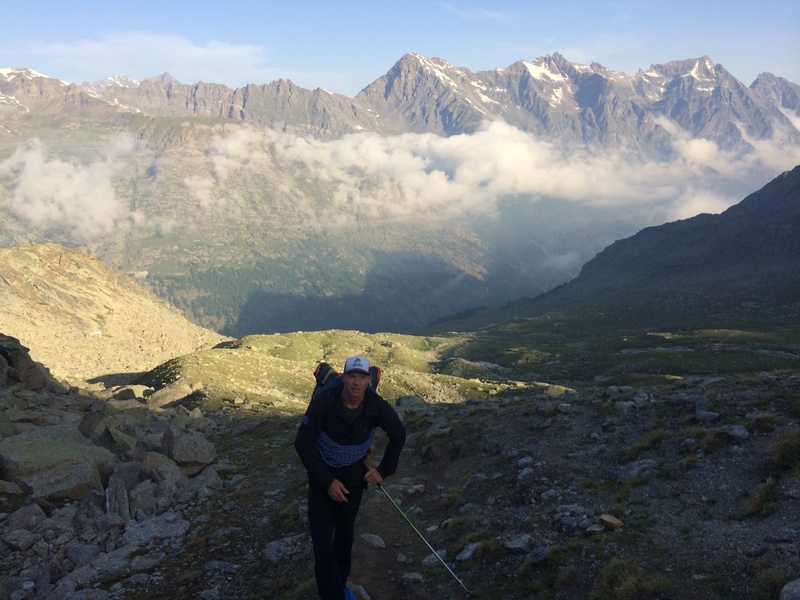 As Neil had taken time to explain to us the previous evening in the hut, Mont Blanc is not a mountain you take chances on. You should never go if you don’t think the conditions are just right, i.e. good visibility and low wind. 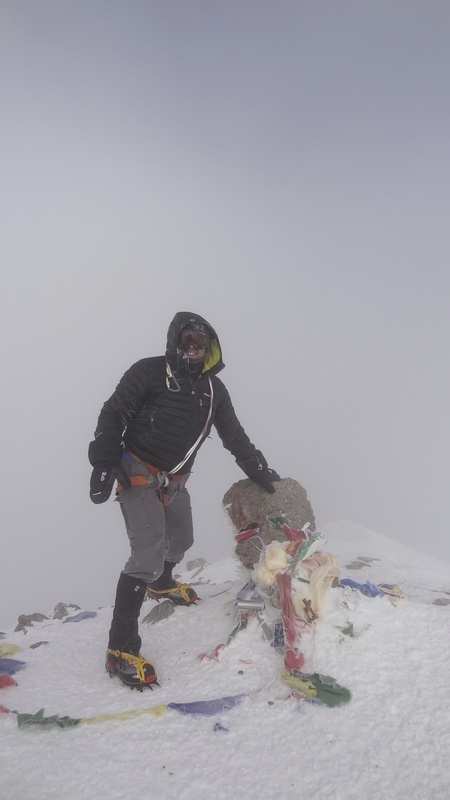 Safety is and always should be the most important factor in the mountains, and especially on a 15,800 feet peak which has killed over 8,800 people, many of these in perfectly benign conditions. Everyone upon getting the news both accepted and fully respected the decision that Neil took. It didn’t stop any of us being disappointed however. It was what we had all come for after all. One, you feel a bit sorry for yourself. You’ve just paid x thousand pounds and taken holiday from work to be told you cannot so what you came for. It’s hard, if only a bit. Secondly you do absolutely respect the decision, and realise that someone is making it rationally and so your safety in mind. Thirdly you realise your vulnerability and mortality. This is not a walk in the Lake District or Wales where you might get wet when the weather turns bad. This is a place where wrong decisions cost lives, and in this case the life being decided upon is your own. Following the announcement Neil suggested that the next few days we would either be able to go ice climbing, or do some via ferrata, depending upon the local conditions in the Chamonix valley. Quite a bit of rain (40mm) was forecast lower down, so this would be weather dependent too. 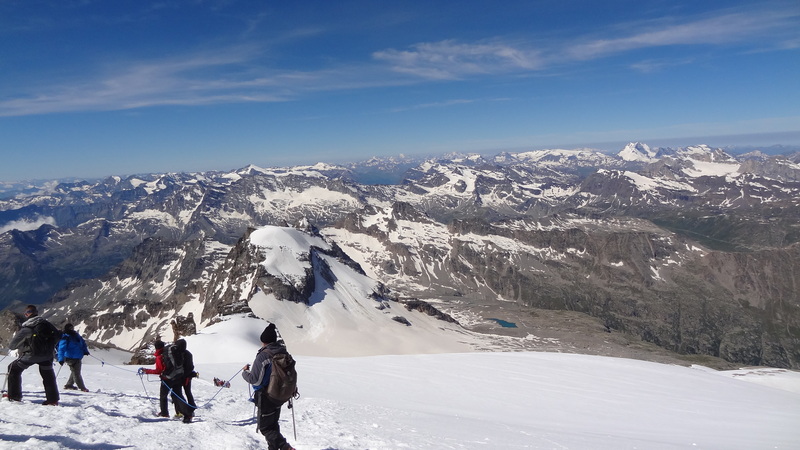 The forecast for Monday and Tuesday over the border into Italy was possibly a little better than that for Mont Blanc, and so it “might” be possible to attempt a summit of Monte Rosa, at 4,280m a mighty summit on the Italian/French border. The forecast was still gloomy though, so it would be all taken on a day by day basis. I made a decision there and then – I was coming home early. It was a hard decision, and as I write this only the next day on the return flight home, I still don’t know if it is the right one. I do know that when I am sat at my desk at work tomorrow morning, having reclaimed three days of holiday that I would otherwise have (of course extremely happily) used, I will feel a tad miserable. I’d rather be sat in Chamonix in the rain any day of the week than being at work pondering the ifs and buts and might have beens. But at the end of the day, it all came down to either doing some things like ice-climbing that aren’t really ultimately “my bag”, and which I wasn’t really there for in the first place, or getting those three days holiday back which I could use at a later date to do more things of my own choosing. So having made it, as I do with all of my decisions, I stick by it and try to have no regrets, which in fact I don’t. 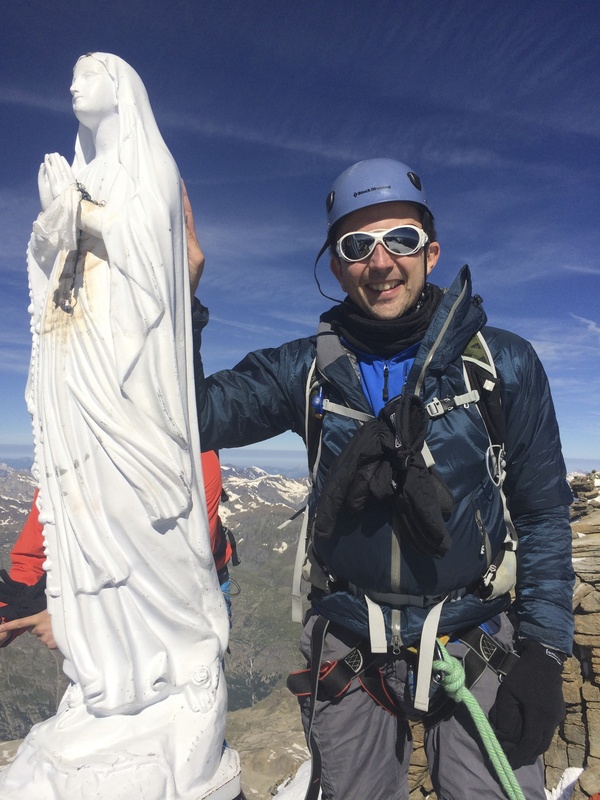 I’d like to thank Mont Blanc Guides for being an outstanding company. If I go back to do Mont Blanc again, which I surely will, they’ll be first choice. 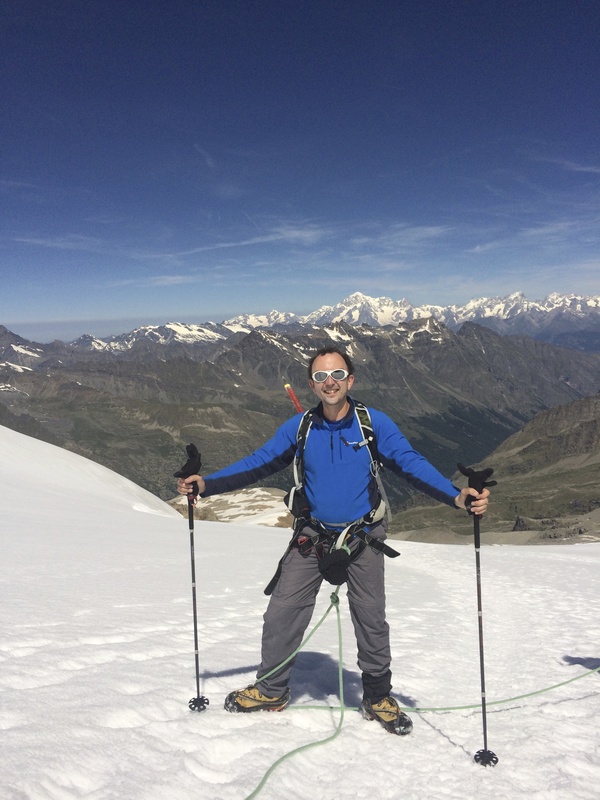 So although I didn’t get to summit Mont Blanc, I look back now on my trip and am delighted that I was there. 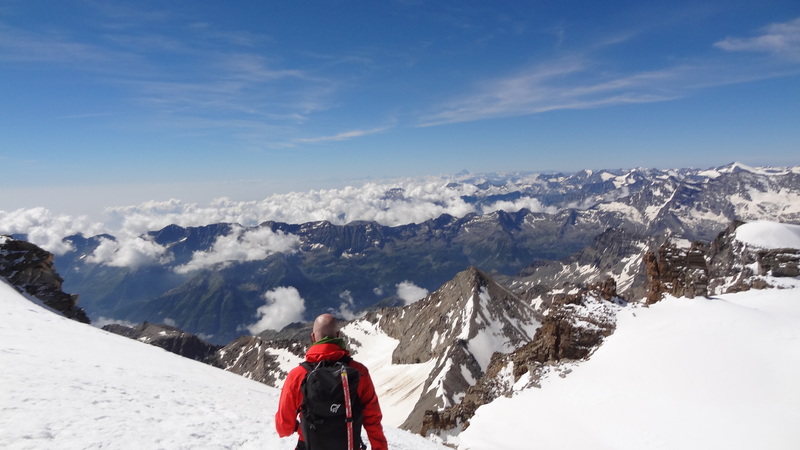 I got to summit the highest mountain in Italy, and my first 4,000m peak in Europe, and in doing so pushed the boundaries of my own fears at the summit ridge. I got to meet some really great people. Some I may see again in fact, and I hope I do. I had a fabulous adventure. I got to go up to the Aguille du Midi, and look from 3,840m up at a cloudless summit of the highest mountain in Western Europe. And it gave me the appetite to go back for more. 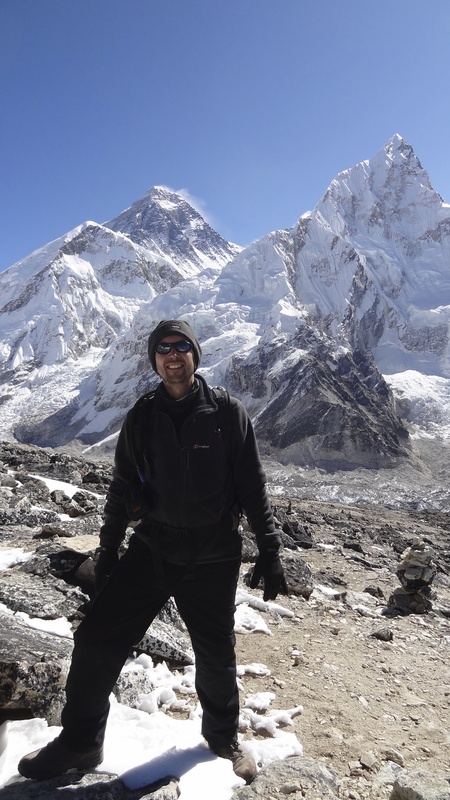 And, in the words of for me the most respected climber ever, one Sherpa Tenzing Norgay, I got to travel, to experience and learn. And I got to live. I really don’t like getting up at 3.45am, and try to avoid it whenever possible. I do however make exceptions where staying in mountain huts is concerned, as that is what you are there for. The very early start in most mountain huts is dictated by one thing, which is how long it will take to summit and get back down allowing for ‘usual’ conditions on the glacier. 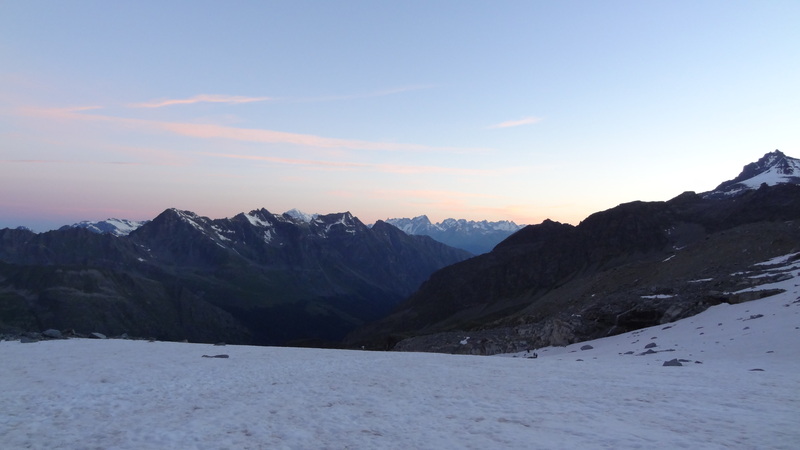 In the summer months the snow conditions on ‘wet’ (i.e snow covered) glaciers tend to be frozen until about mid-morning (depending upon what time the glacier gets the sun and what direction it is facing). What you need when walking up them, is for the snow not to be soft, as your crampons don’t get good purchase and you can sink into the snow, which at best just saps the energy. It’s hard enough as it is without that! 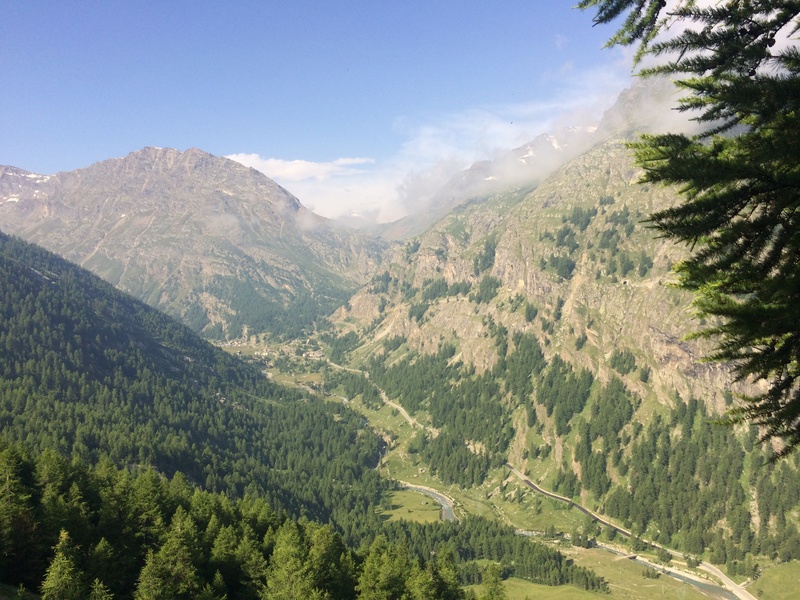 So anyway, this morning I find myself waking up in the Chabon hut near Gran Paradiso at exactly the above time. Breakfast, a hurried affair of dry (and that’s an understatement) bread and some cornflakes with luke warm milk, is just not very appetising, but it goes down, and within about 20 minutes or so everyone is outside getting into harnesses and getting crampons and helmets and the like sorted. 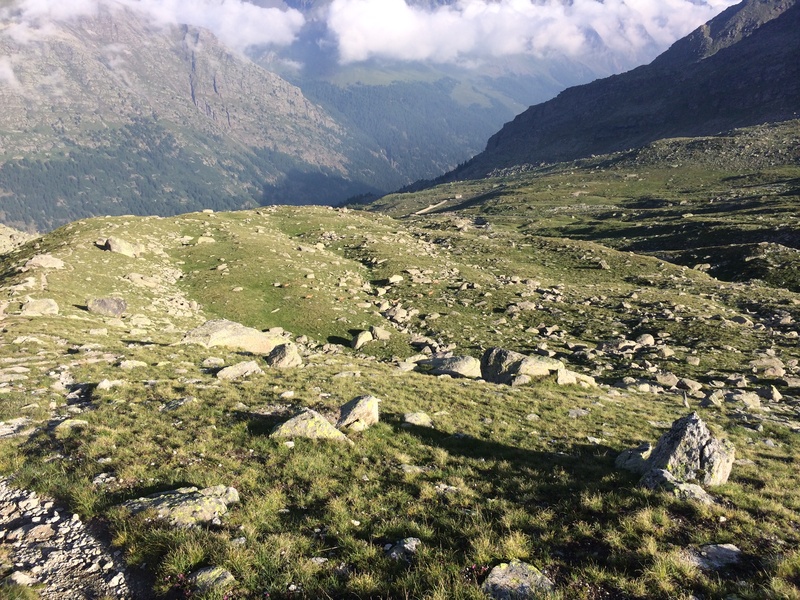 There are 80 people in the hut altogether, and everyone is there for one thing – to summit what is effectively Italy’s highest mountain, Gran Paradiso. It is about 4.45 in the end by the time we set off, due to a number of people faffing with their kit, including me. It’s made harder by the fact that it is still very dark, and headtorches are the order of the day. 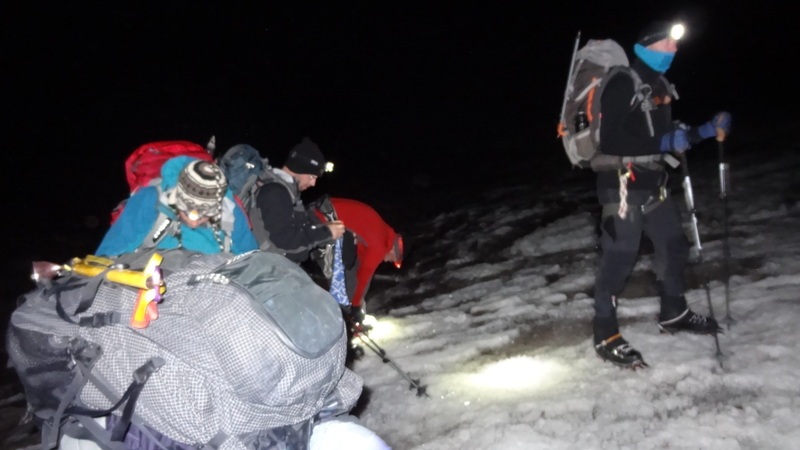 When we set off we follow a string of other headtorch-bedecked individuals who are already snaking their way towards the glacier. 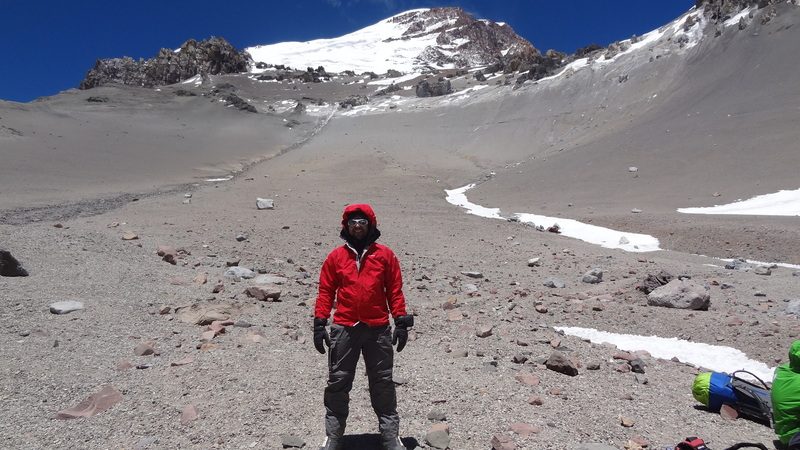 The hut is at 2,700m (just shy of 9,000 feet , and our objective is at 4,061m, or 13,400 feet. 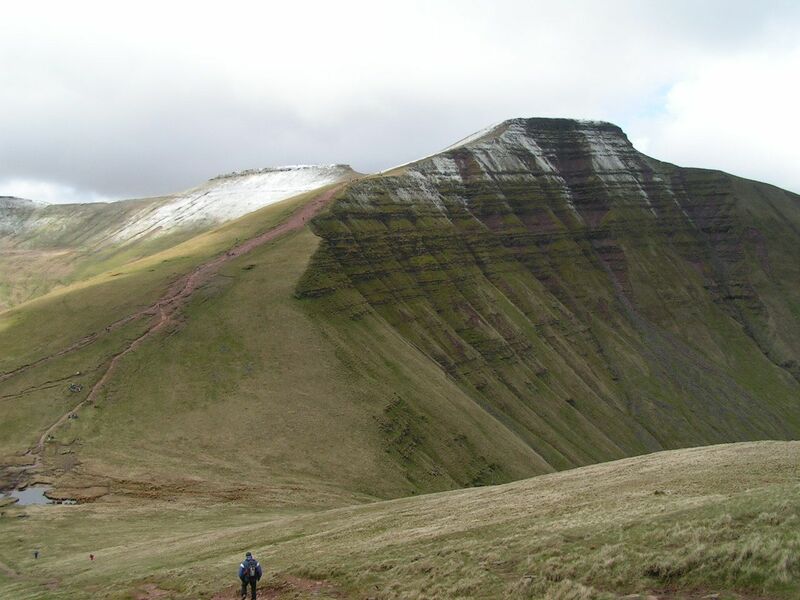 The walk is steady at first, over rocky moraine mainly, but pitches up quite steeply in places, which very much gets the heart going. 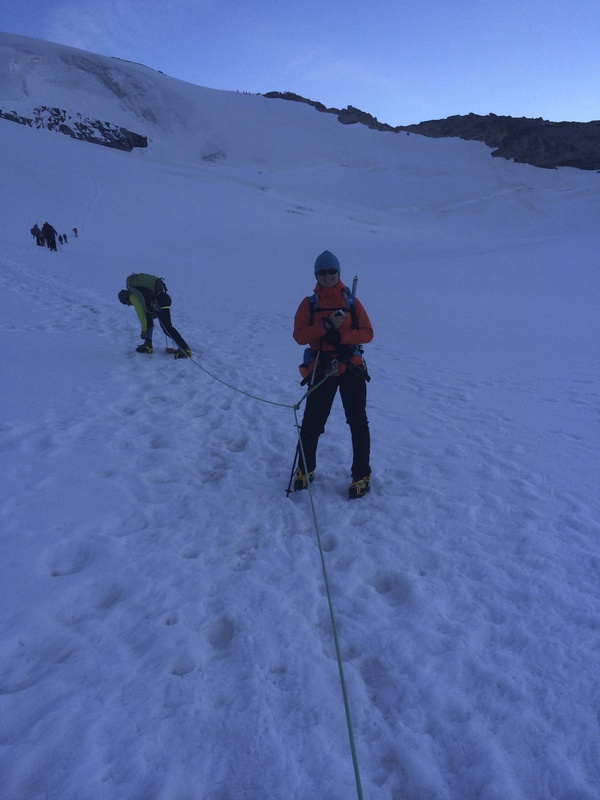 First light over the mountains, and we are on the glacier already…..
….with crampons on and all well wrapped up – it was very cold! By probably 6am or so, it is light, and there are magnificent views already over the French and Italian Alps. There is not a single cloud to be seen in the morning sky. 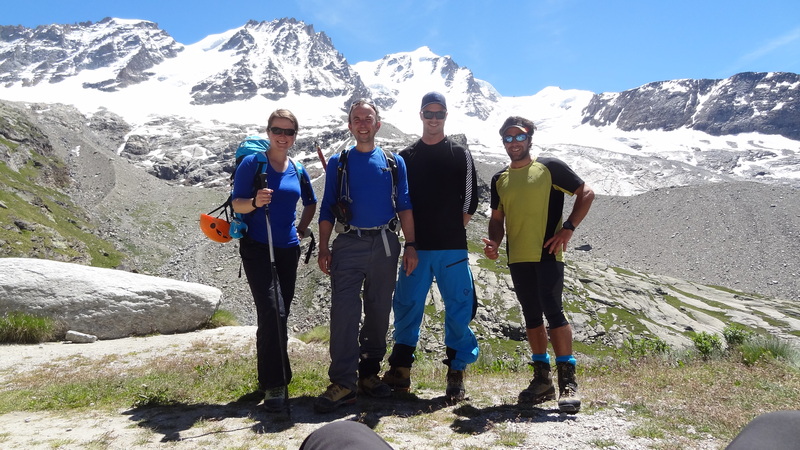 We reach ‘crampon point’, a figurative spot where travel is much easier with them in place, and we get ready. We also rope up, with the team set in a group of 3 and 4 with a guide leading each group. I am roped up with Marco, our Italian guide, and grouped with Katya and Jonas. Neil, the main group guide, has Rich, Stuart, Mick and Colin. It is cold, much colder than I had anticipated, and as we meander up the glacier, which is steep, the wind picks up, and before long I am grateful that I packed my rucksack well. I am now wearing two pairs of gloves, a buff, a woolly hat, and three layers, including a fleece and a light down jacket. I wonder for a while if I even have enough with me. By the time we reach the top of the glacier, at probably around 8am, it is freezing cold. And I mean cold so you can’t hardly feel your fingers cold. I make a mental note to buy some better gloves for when I go to Russia in a month or so’s time. At this point we turn an abrupt left onto a much steeper incline towards the summit, which now becomes visible for the first time. Thankfully at this point the sun came up and it warmed things up immeasurably. The last quarter mile or so to the summit is fairly hard work, as a.) you are now at 4,000m, and b.) it is probably the steepest part of the whole mountain. 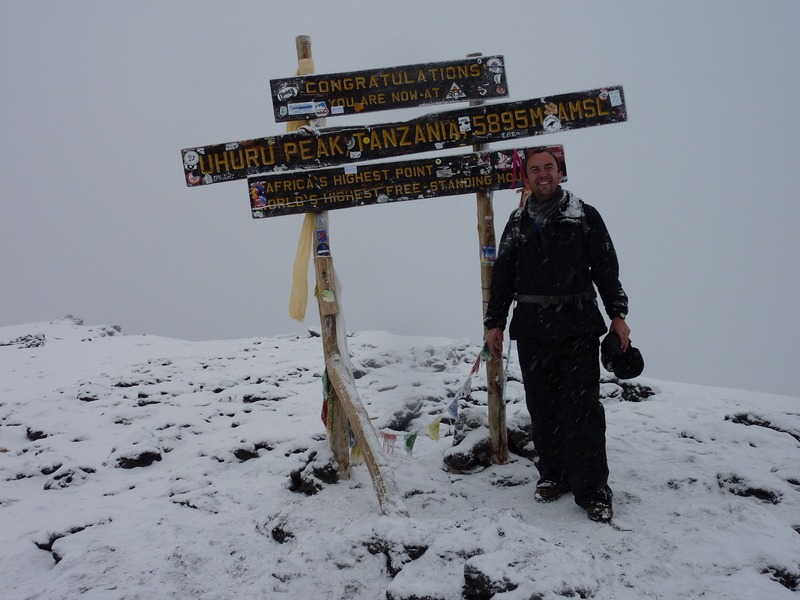 But like most mountains you ever get close to the top of, the adrenaline (or summit fever!) kicks in, and you just push on. Getting up to the summit ridge itself proved fine until the very last 5 or 6 metres. The problem was twofold – firstly the summit ridge is a narrow band of rock, which is basically one person wide at best, and the summit held about three people at best, so it was “one on one off” when you got there. Secondly it was, as our guide put it “very airy”, aka it had precipitous drops on two sides, so your heart was in your mouth to actually get the final few steps. Looking back down (the trail in the distance) from the summit to where the previous photograph was taken from. After a few moments when I doubted whether I wanted to go the last few steps at all (the bottleneck took about 20 minutes or so to wait for people to get off the summit), the last piece was somewhat nervously executed via ferrata style on a ledge no wider than one boot width, and a 1,000m drop below you. It is not for the vertigo suffers amongst us, that’s all I’m saying! The views from the top were fabulous, and with such clear skies there was a view of mountains in every direction, spanning Switzerland, France and Italy too. Mont Blanc stood sublime in the distance, taunting us and tempting us at the same time. It would only be two days now until we would be at her base to begin the big climb! 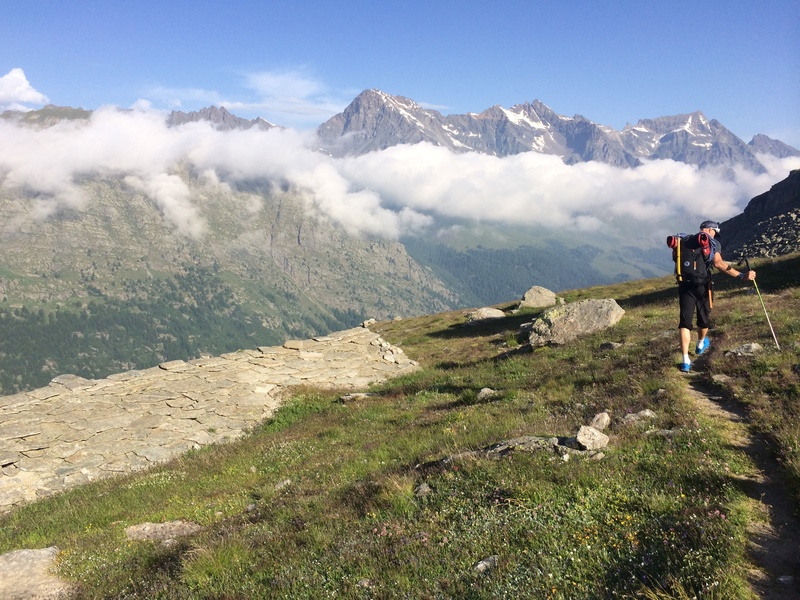 ….still above the clouds in the distance…..
…and trails of roped up climbers ahead of us meander down the glacier. And Mont Blanc appears again in the distance. Memo to self – don’t stand on the rope! 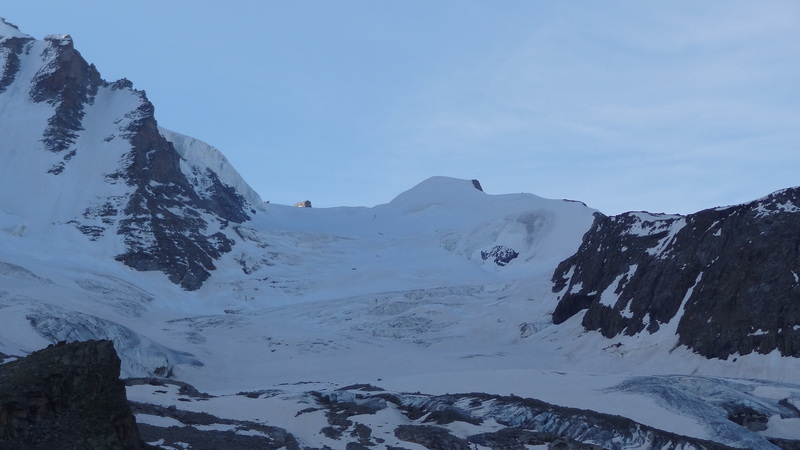 And finally upon reaching the bottom of the glacier, our hut appears a long way in the distance, middle of picture. Happy at our return to the hut! Everyone was so beat that a well earned lie down ensued for all, and then time to pack everything up again for the trek down the mountain the next day, as we’d stay another night in the Chabon hut. After we’d all had dinner, the news that we didn’t have to get up until 6.45 the next morning came as a huge relief. An extremely pleasant couple of glasses of wine then followed to round off a really memorable day. The guides told us after dinner that the weather forecast for the weekend was looking a bit dodgy, but that they’d know more when we got back to France the next day. They quite rightly pointed out that Mont Blanc wasn’t a mountain to take chances on, but that no decisions would be taken until we got a better picture.